or girl in service. They love to play them alone, or form musical groups with these song flutes. Well made of lustrous plastic with a shiny finish. many popular songs that you can use. Flute is 8%' inches long. Packed in attractive carton. N 5469-Please order _by catalog number and ti.tie number. Y-9-The Night Before Christmas. (1) Songs children never tire of. .
-363 songs. Shpg. wt.,-1 lb. 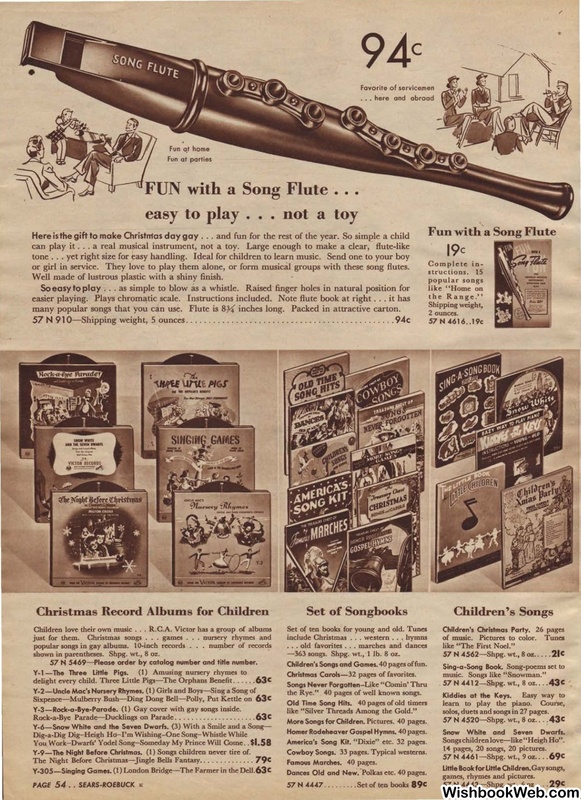 Children's Songs and Games. 40 pages offun. Christmas Carols-32 pages of favorites. the Rye." 40 pages of well known songs. like "Silver Threads Among the Gold." More Songs for Children. Pictures. 40 pages. Homer Rodeheaver Gospel Hymns. 40 pages. America's Song Kit. "Dixie" etc. 32 pages. Cowboy Songs. 33 pages. Typical westerns. Dances Old and ·New. ·Polkas etc. 40 pages. solos, duets and songs in 27 pages. Snow White and Seven Dwarfs.